I listened to you and let Lucas play keeper. You won’t believe what happened next! Remember a few weeks ago when I asked you if I was crazy for not wanting my sweet little baby boy to play keeper for his soccer team? And to a one, you told me yes, I was being crazy, and to get over myself and let the child play keeper, for the love of soccer? You win this one, oh wise bloggy peeps. You were so right! Lucky for me, Lucas had some clever, experienced parents giving him good advice. My friend and guide to the world of soccer parenting Lesley told me that if I were to tell him one thing, it should be that he is allowed to use his hands in goal, so don’t be afraid to grab it. That was better advice that what I’d come up with, which was an encouraging grin masking a flinch of nerves. Lucas had his turn as keeper in the second half of the game. They’re not exactly the best team in the league, and it’s not unusual to see teams run up goals against them, but I was pleased to see that on the night Lucas was scheduled for keeper, at least they weren’t getting trounced. He’d been in goal, I kid you not, about 90 seconds when the other team’s best player sent a hard boot at him from about six feet away – and Lucas took it full in the face. It was exactly my worst fear, and of course it hurt and of course he cried. He came off for a few minutes, went back on, flinched away from the ball as it came toward him and came off again, not quite done feeling the sting of the shot. The coach was great, told him as soon as he was feeling better he’d put him back in goal, and another mom had an ice pack handy. Best of all though, was my brother Sean. 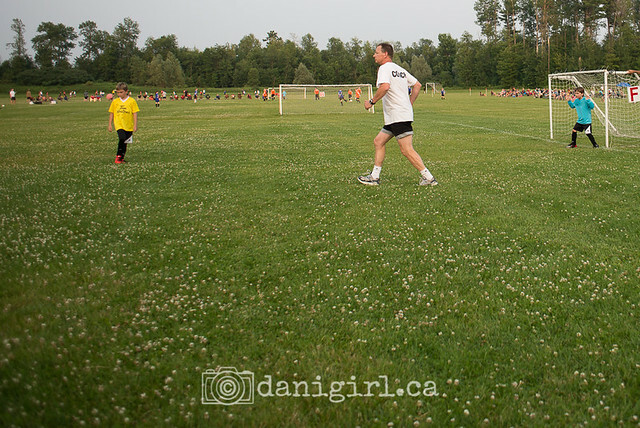 Sean, whose kids have been through a couple of years of soccer between them, had come along with the big boys and his son to cheer Lucas on, and he came over to make sure Lucas was okay. Sean coached Lucas to stand in a bit of a crouch with his hands up in front of his face to protect it. Zoomed in – the play is nowhere near, but he’s ready and he is 100% focused on where that ball is! Sean joked that Lucas would likely sleep that night in the same crouch, his hands up to protect his face. The very best part was watching him shake it off and actually make six or seven saves. He took one hard one off his hip (he learns, I’ll give him credit for that: he took two hard balls to the ‘nards last week, so he’s learned to protect what matters!) and clearly he listened to Lesley’s advice because he made several other saves by reaching down and plucking the ball out of play. He only let in two goals, which is not bad at all for a team that has lost by double digits more than once. You were so right, oh wise bloggy peeps, and I was wrong. And the joyful, fierce look on his face for the rest of his night in goal was like a gift. He loved it, when it stopped hurting. I gotta tell you, I had no idea. And that ball to the face was a damn good lesson – he did not take his eye off the ball for the rest of the game! Of course he said keeper. Of course he did. Love it! You just never know…Good fro him (and you). Next time he makes one or two more saves and you lose by even less, or, perhaps you get a win although I doubt they’re keeping score formally. That’s awesome news! Yeah Lucas! I am going to give the jellybean the same crouching advice. 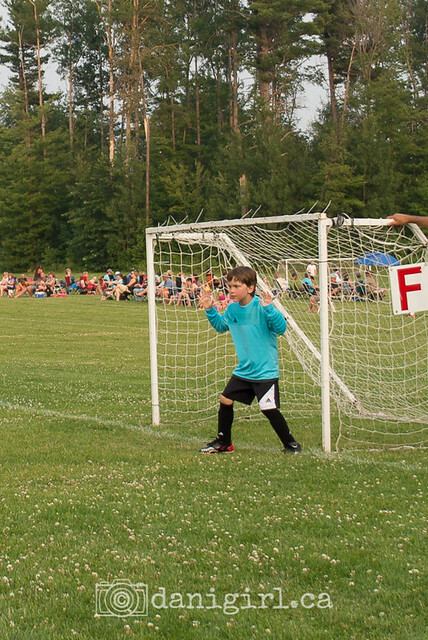 He played keeper this past weekend and got pummeled. But the hubby said he shook it off well enough (I unfortunately was working and didn’t see the game 🙁 ). And Yeah to you for letting him go for it.. If a few short years he won’t even flinch when he gets a ball to the face. They start to become immune to the sting. Previous post: Happy National Chocolate Day! Next post: Vintage comic collection for sale – more than 2,100 books!